Theban Armoured Hoplites 5th to 3rd Century BC. This fantastic set of miniatures represents Greek Hoplites of Thebes Boitia and Thessaly from the 5th Century covering the end of the wars with Persia, to the 4th century and the titanic struggle for Greek supremacy in the Peloponnesian war against Athens, Thebes rise and battle for Hegemony over Greece and the destructive war against Macedonia . 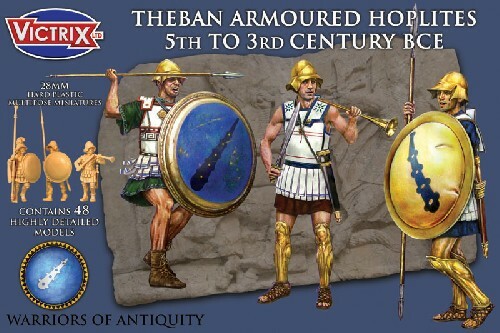 Included in the box is a fantastic flyer produced for us by Great Escape Games giving you unit statistics for your Ancient Thebans to work with their Ancient Rules ‘Clash of Empires’, a superb set of rules that really capture the flavour of warfare in the ancient world. Plastic 28mm sized figures, supplied unpainted. Glue is required in the assembly of Victrix plastic Thebans.